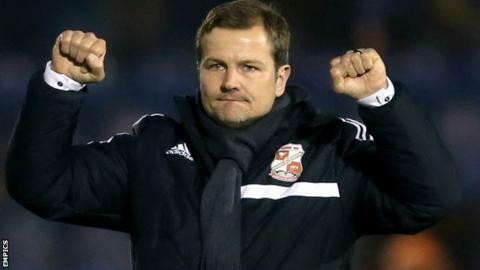 Manager Mark Cooper wants Swindon Town to better last season's achievements and reach the final of the Johnstone's Paint Trophy at Wembley. Town lost on penalties in the area final second leg against Peterborough last term, and Posh went on to beat Chesterfield to the silverware. Cooper's side travel to Newport for their first round tie on Tuesday. "This gives you a real opportunity to play at Wembley," the Town boss, 45, told BBC Wiltshire. "We were a penalty shoot-out away from getting there. We were so close last year so now we want to go and play at Wembley, of course we do. "But Newport will fancy their chances. They're a big, powerful team that take no prisoners. We won't be underestimating them at all." Swindon are fourth in League One, with only one defeat from eight games, and come into Tuesday's trophy tie after a 5-2 win over Sheffield United. To adhere to Football League regulations, Cooper has to play six members of the team that beat the Blades for the trip to League Two Newport. The Town boss confirmed on Monday he would replace first-choice goalkeeper Wes Foderingham with back-up Tyrone Belford, while Massimo Luongo (leg), Raphael Rossi Branco (groin) are unlikely to be fit. "I don't like making loads of changes, as you're putting a whole new team together," added Cooper. "If we are going to change the team, it's maybe three or four. We don't want to make wholesale changes as we want to keep the momentum going."